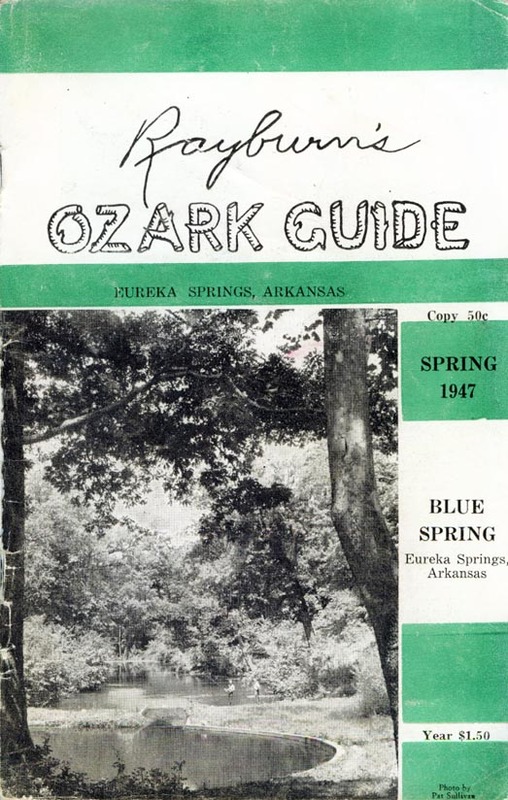 The stack of magazines bore the title Rayburn’s Ozark Guide. Here I was, in an antique store in Madison County, thumbing through these curious publications dating from 1943 to 1960 – each with a single color background and a black-and-white image. All had interesting covers: Blue Spring in Eureka Springs, a waterfall at Hog Scald and, on another, an Ozark woman standing next to her spinning wheel. With a price tag of a mere $10 for the 20-something issues, I was walking out of the store, clutching the stack with one simple goal: to go home and absorb it. Once I did, one thing was obvious: This Rayburn guy loved the Ozarks. No, that wasn’t it. He lived and breathed it. Up to this point, I had never heard of Otto Ernest Rayburn, the magazine’s editor and publisher. Had it been the 1940s or 1950s, I might have. Arkansas folklorists and travelers in Northwest Arkansas during the time were surely familiar with Rayburn, who gained kudos from publications like The New York Times and others for his 1941 book, Ozark Country. He also had collected and alphabetized a massive amount of material on the Ozarks organized in 226 whopping volumes he titled The Ozark Folk Encyclopedia. It is now housed at the University of Arkansas Libraries’ Special Collections. A better known Arkansas Ozarks folklorist, author and musicologist Vance Randolph, knew him quite well. Not only was Rayburn a peer to Randolph, he was also a friend. It was Randolph who wrote the forward to Rayburn’s autobiography, Forty Years in the Ozarks, which was published in 1957. In short, Rayburn was my kind of people. Rayburn’s Ozark Guide was filled with so much love and sense of urgency that organization never seemed to be much of a priority. The magazine measured 5.25 by 7.5 inches, and varied slightly in size depending on the year. Each issue offered “Rural Musings,” a column by Rayburn himself that was either personal or focused on Ozark life. The rest was jam packed with a collage of anecdotes, reviews of books featuring folklore and the Ozarks, poems, photos of hill folks, places and a selection of advertisements where the Basin Park Hotel in Eureka Springs – where Rayburn spent his honeymoon in 1925 – was a prominent and loyal client. Rayburn wasn’t opposed to reprinting favorable comments and reviews about his work, either. Rayburn referred to his work as “wildcat journalism,” likely a reference to his early experiences in the Ozarks. Born in Iowa in 1891, he went to college in Marionville, Mo., before relocating about 30 miles southeast in Reeds Spring, where he spent $200 for an unfinished shack to live in the wilds of the Ozarks. A romantic, he lived out a scene reflected in On Walden Pond, written by one of his heroes, Henry David Thoreau. He ate wild game and fish and received heat during the winter from a legless wood-burning furnace propped on a dirt floor. When money was tight, he picked up teaching jobs. Eventually, he settled down in a respectable home with a wife and family and pursued his dream of journalism with the Ozarks always playing a prominent role. He continued with it until his death in 1960. I don’t expect to pick up the torch from where he left off – that would be a lofty chore. But if it’s possible to carry the spirit, I would like to give it a shot. I have plenty of things I want to share – things I have learned through the decades of living in the Ozarks. I can’t expect to reach the expertise, or the talent, of Rayburn. I’m certain, however, if Rayburn had access to the Internet, he would have his own website, promoting all things Ozark, from the Ozark Folk Festival in Eureka Springs, which he managed, to his little book shop on Spring Street in the same town. Yet there’s one thing we both have in common: the drive to write about what we love. The place known as the Ozarks. This entry was posted in Boston Mountains, Eureka Springs, Folklore, Ozarks and tagged Eureka Springs, Otto Ernest Rayburn, Ozark Folk Encyclopedia, Ozark Folkways, Rayburn's Ozark Guide, Vance Randolph. Bookmark the permalink. Quite a character…it’s amazing what a random stop at an antique store can uncover! Sandra, this is great stuff. I am really glad that you’re doing this website!